Rick, firstly thank you for taking out some time to talk to me about the Festival….Tell us a bit more about Krav Maga and how you got involved yourself? Krav Maga is an Israeli self defence system. It’s very effective and simple, based on core principals and easy to learn techniques. There are some Krav Maga systems structured like traditional martial arts, but in Pure Krav Maga we use the original IDF Krav Maga as founded by Imi Lichtenfeld. I was introduced to it in the USA many years ago and I eventually trained with Boaz Aviram. Boaz is the ex-Chief Instructor of the Israeli Defence Force and knew both Imi and Eli Avikzar. So you will be doing a display at this year’s festival, what can people expect to see? 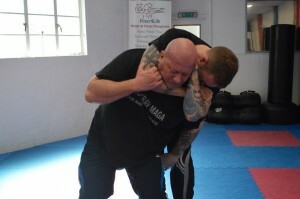 Yes, we’re doing a display, which I hope will give people an insight into how simple yet effective Krav Maga can be. We will run through some basic scenarios of defending against threats, punches, kicks and grabs, and maybe some defence against weapon attacks too. What people won’t see is lots of spinning, jumping and rolling – in Krav Maga we use efficiency wherever possible. The festival’s ethos is to nurture and promote local performing arts and sports in many forms. How do you feel about having the festival as a platform to raise awareness of Krav Maga? I really appreciate the local focus of the festival. I’m not native to Ashford but I’ve made my home here and I love how much activity and creativity there is in and around the local area. The festival is a great platform to showcase local talent and sports and for us to have the opportunity to sort of ‘de-mystify’ Krav Maga and show that it is appropriate for all ages, abilities and levels of fitness and commitment. Finally….Where can we find out more about Krav Maga? Well, I’m going to have to say that people can find out more on our website www.purekravmaga.net and on Facebook at Pure Krav Maga Kent, but there’s a really good independent resource at whatiskravmaga.webs.com.